They don't come much stranger than this. 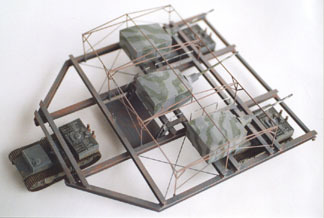 A three-view plan can be found in Der Panzer-Kampfwagen Tiger und Seine Abarten by Walter J. Speilberger of what appears to be three large turrets, each with a 12.8cm gun, on an I-beam girder frame measuring approximately 17 metres by 15 metres. It is carried by three Tiger I chassis, two at the rear and one in front (the guns face rearward). The frame is topped by a rectangular wooden building that completely covers the turrets except for the gun tubes. The building has three sets of double doors, which when opened, allow some traverse and elevation of the guns.Projekt NM only existed on the drawing board, although all of its component parts were readily available. It only takes a cursory inspection of this machine to rule out its use as a "tank". Firstly anything 15m wide would be extremely awkward to manoeuvre anywhere. Tactical mobility would be a problem, for to cross a waterway or ditch it would require three bridges or one very wide one. In order to engage the enemy, it must perform a stately U-turn in order for the guns to bear. This may be feasible in open country, however the building or shed covering the turrets would stand out while performing no useful concealment function. It would be of no more use for fighting other tanks than three separate tanks would. Disguising something as a building would only be of use where it would not look out of place. Even a solitary building on the coast would attract a lot less attention than three gun turrets. I imagine this vehicle reversed into a position overlooking some likely invasion beach, and pretending to be a harmless wooden building. As drawn NM could be shifted between prepared sites as a means of avoiding unwanted attention. I suspect the building would be considered expendable once the shooting started, and merely traversing the outer turrets would be sufficient to clear most of the structure away. Several hints point to German Navy involvement. Tank projects tended to have either a VK number, or a name (e.g. "Lowe") or some abbreviated descriptive name (e.g. NbFz). The Kreigsmarine were big on letters, "H and "J" were battleship projects, I believe. The extensive I-beam construction is fairly normal for warships, not AFVs. Finally, the "building" limits the vision of the gunners. However if the guns were controlled by a director sited elsewhere, it would not be a problem. Having several turrets aimed externally is something navies have been doing for many years. Weight of the whole assembly would be anybody's guess, however there would be an upper limit of 165 - 180 tons, based on the suspension capacity of the Tiger carriers. Despite its apparent complexity, it is actually an easy job and even if you haven't scratchbuilt before, have a go. Apologies to 1/35 modellers, I am into the small scales and made my NM in 1/76, but there is no reason why it could not be done in large scale (apart from finding somewhere to put it!). Most of the comments below would still apply. For the carriers I used Airfix Tigers. They are cheap to buy, and although the tracks are rather plain, the rest of the kit is quite acceptable. Of course Fujimi make a very nice (and expensive) new Tiger, but I wasn't about to buy three of these and cut them up. I made the lower hull and running gear as per instructions. I cut the upper hull in front of the engine deck, and behind the front (driver's) plate. This front plate was cut down flush with the lower hull sides so the only overhang is the engine compartment. As I assumed the carriers would be unarmoured, I replaced the driver's visor with a clear window. The rest of the vehicle was made from sheet styrene. I simply scaled from the plans in Spielberger. The Airfix tiger is 2.268 times as long as the Tiger carriers drawn on the plan, so it is a simple matter to measure from the plans, get out the calculator and multiply everything by 2.268. For 1/35 the magic number is 4.93. I used Plastruct 1/4" (6.4mm) I-beam for the main frame, one problem I found was that while it looks good for height, it is too "square". I ended up cutting the flanges to make the beam narrower. For this you need a tool such as a balsa stripper or similar. Alternately, by using styrene strips you can make your own I-beam (as I did when I ran out of store-bought.) When making the frame, leave the diagonal I-beams at the front until last. Assemble all the longtitudinal and lateral beams, and before the glue sets measure from corner to corner. If the diagonals are equal, everything is at 90 degrees. Note that the beams that connect to the tank hulls are smaller, about 4.8mm high. The very front beam is C-section, not I-beam. There was nothing in the plans to suggest how the Tiger carriers connected to the frame. I made a guess that it would be some sort of coupling or turntable, similar to that on a prime mover except that so it does not twist the frame it should be fully oscillating, in other words it should be able to hinge side-to-side as well as fore-and-aft. The turrets were made from pieces of 0.040" styrene sheet. Nothing difficult. Note that the sides taper in at a different place to where the roof slopes. The logical place for the turrets to pivot from is midway between the two I-beams they sit on, but that seems too far back. There are two further smaller pieces of I-beam under the turret, these are not shown as part of the main frame, I suspect they turn with the turret. Barrels and mantlets were turned from solid styrene rod, I used an electric drill as a poor man's lathe. I made the guns movable by having a pivot just inside the turret front. Each gun has a small lead weight inside the turret to balance the weight of the barrel and mantlet. The four walls were made from 0.020" styrene sheet. On the sides I scribed parallel grooves about every 1/8" and then roughed up the surface with a razor saw blade. This produces a good wood-like finish on the surface. The roof was one 0.020" sheet, bent to form the ridge. Before I assembled the shed, I scribed and cut the doors from the rear wall. Door hinges were made from small L-shaped pieces of fuse wire inside short styrene rings cut from tube. I admit these aren't pretty, but there doesn't seem to be a good alternative if you want 180 degree functional doors. The following is what I consider the finished assembly would probably feature. When information on a vehicle is minimal, at some stage the modeller sometimes has to resort to making an educated guess. The alternative is to never finish anything for fear of getting some trivial detail wrong. The drawing in Spielberger seems to show some platform between the centre turret and the lead carrier. It is not clear. Assuming the crew would have to access the turrets, and at some stage open the shed doors, I placed ladders and catwalks in suitable places. I assumed the turrets would need doors in either the sides or rear, the sides seemed most suitable. The drawing appears to show attachment points for the shed frame, I made a separate internal frame for the shed from 1.2mm styrene rod. 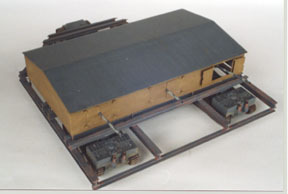 This locates in tube attached to the main frame, and also serves to show the ghost outline of the shed when displaying the model.